Most of us know that the use of leather in the construction of weapons and equipment for warfare dates back thousands of years to the earliest days of man. However, you may not know that the process of tanning the raw hides of animals into leather using bark and other vegetable materials remained remarkably the same until only about one hundred fifty years ago. It was not until the late 19th century that significant industrial changes and a natural calamity forever changed the methods, quality and even appearance of leather. Today, much of the traditional tanning methods are largely forgotten even by commercial leather producers. More significantly for Civil War historians and collectors, our knowledge of war time leather manufacturing, the considerable problems leather tanning and dyeing wrought upon the Federal Ordnance Bureau and the tremendous effect on today’s artifacts is also largely unknown. That is, until now. Figure 1. 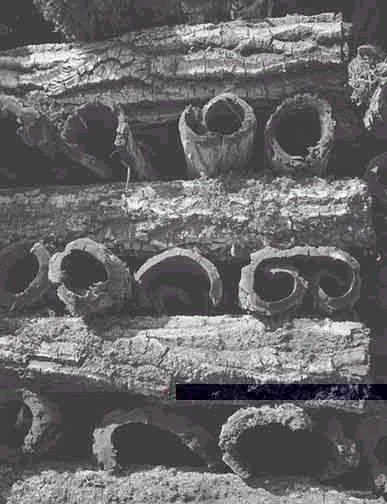 Bark removed from trees, stacked and ready for drying. After drying it would be ground into powder for use in the tanning process. To be sure, leather tanning was big business by 1860. The 1860 U.S. Census lists over sixty-three million dollars worth of leather sales most of this in the manufacture of shoes and boots by the 12,486 footwear firms then in the United States. 2. In 1858 alone, 610,000 ready-made boots and shoes were “exported” to Europe! 3. 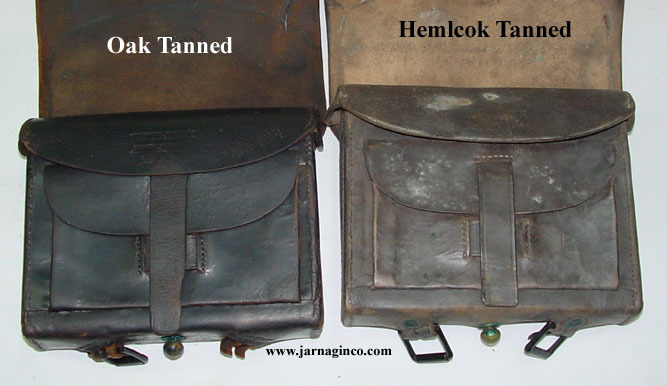 For commercial tanners of the era the use of Hemlock tanned leather was clearly more profitable than Oak. In the 1860’s it normally took from five to seven months to tan a hide. Since Hemlock had a higher percentage of tannin than Oak it thus shortened the tanning process by a month or more. Another advantage was that Hemlock tanned hides tended to be heavier and therefore brought more money because hides were sold by weight at that time rather than by square feet as they are today. However, the most interesting aspect of hemlock tanned leather and one that created enormous troubles for the Federal Ordnance Department during the war and for collector’s today, was the inert tendency for the dyes of Hemlock tanned leather to fade, often quickly, from black to brown. A serious problem then and one today that often leads collector’s to mis-identify artifacts as Confederate, re-dye them or worse, even reject as illegitimate otherwise quality artifacts. During the war, hundreds of thousands of troops signed up for service in the Federal armies and of course, they all needed leather accoutrements. Since the regulations called for black leather accoutrements and equipment the U.S. Army tried to keep hemlock tanned leather from being used due to the fading problem. 4. However, this quickly became impossible to control. Huge amounts of leather were quickly needed and contract tanners were very skillful at subverting the ordnance department rules by substituting hemlock for oak. Quality control was further complicated by the fact that leather was dyed and finished at the tannery before equipment manufacturers received the hide, so the Ordnance inspectors could not easily tell what type of tanning agent had been used. According to Ordnance records, hemlock leather could be “doctored” or bleached to match the color of oak tanned leather before being dyed. This could be done to such a degree that even expert inspectors had difficulty telling the difference. 5. The following post war Ordnance Department report shows the extent of the problem. “It is certain that large quantities of “doctored” hemlock-leather were sold for oak leather during the late war. In some cases where it was used for scabbards, or iron and steel came in contact with it the alum and salt and vitriol, &c.., used to bleach it, rusted the iron and steel, and so betrayed its illegitimacy; but thousands of sides were sold and used in blissful ignorance by all except the seller. If only deceit were practiced, it would not be so utterly objectionable, but the quality of the leather is injured by this doctoring, and it further deteriorates by age.” 6. Figures 2A & B. Hemlock tanned 1859 pattern two rivet bayonet scabbard. Note acid damage in bottom photo. Figure 3: Hemlock tanned Watertown Arsenal cartridge box. Note cracks in leather due to acid damage. There was another type of tanning process that should be mentioned- “Union-tanned” leather or “mixed” tannage. This method used a combination of both hemlock and oak bark as a tanning agent. The tanners of the time believed mixing hemlock and oak barks would produce leather of better quality than either bark by itself. Ratios of hemlock and oak barks would vary but leather produced in this manner apparently still had fading problems inherent with hemlock and were thus not acceptable to the Federal government. 8. In December 1863, 546 cartridge boxes manufactured by contractor James Boyd were rejected as being made of mixed tanned leather. Boyd wrote to George D Ramsay, Chief of Ordnance in an attempt to get the cartridge boxes accepted anyway by arguing the difficulties of maintaining a supply of oak tannage. Nevertheless, shortages no doubt often forced the War Department to accept equipment of inferior leather. In fact, the Ordnance Bureau goes so far as to list all three types of leather in a July 1864 advertisement for contract bids stating, “Separate bids will be received for the manufacture of these accoutrements of pure oak leather, of mixed tannage oak finish and all hemlock.” 10. After tanning the next step was for the leather to be dyed black to meet the regulation standard. At the time of the Civil War, the most common leather dyeing formula of the period combined a skillful blend of craftsmanship and a chemical reaction between the natural tannin found in bark and various other components most notably iron mordants. When the iron comes in contact with the tannin the leather turns black. This process, when done correctly on oak tanned leather, produces a deep, rich and permanent black color. But, it was far less successful on hemlock tanned leather. If the tanners were so skillful in producing leather dye then why was hemlock tanned leather so incapable of holding dye? This question required an investigation into the chemical reaction processes of the period dyeing formulas. Experimentation by the author with several formulas including those found in some rare 19th century tanning books re-discovered what the early tanners knew all along – that hemlock tannin would not seriously bond with the iron mordants to change form and thus turn the leather black. However, it is clear tanners routinely dyed hemlock leather to black. But how? Once again a formula from the old tanning books provided the answer in the form of a recipe for “stained” leather. This formula utilized logwood and Sal soda which when combined with hemlock leather tannin formed a chemical bond that would turn the leather black- if only temporarily. It also had the additional advantage of adding weight which was important because leather was sold by the pound until about 1885. Unfortunately, logwood eventually oxidizes, causing the iron to change form again and gradually return the leather from black back to brown. 11. Thanks to Fred Gaede for the use of these pictures. 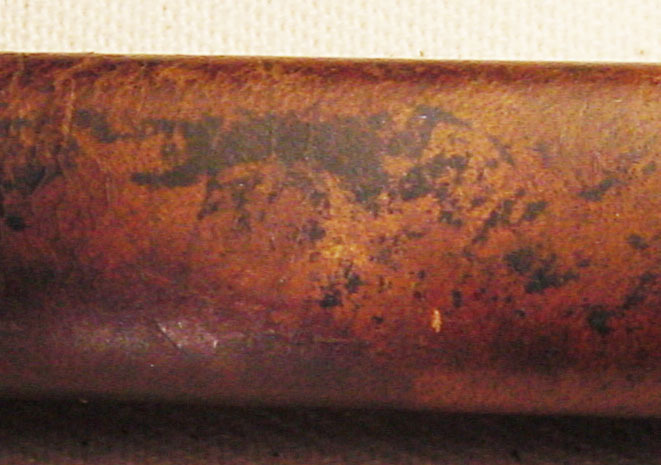 Figure 5: Close up of a hemlock tanned pattern of 1859 bayonet scabbard with what’s left of lamp black finish applied to the grain surface. The remains of this type of finish give it a 3-D appearance. Interestingly, experiments by the author with the leather dyeing formula found in The Ordnance Manual for The Use of the Officers of the United States Army found it hopelessly inadequate for dyeing leather. However, experiments with other formulas found in the early tanning books were far more effective and predictable. But why? Modern tanners suggest the reason was that early tanners were very evasive, competitive artisans that jealously guarded their trade secrets including dye formulas. They speculate that the Ordnance officers writing the manual relied upon these tanners to provide the dye formulas published in the manual. Modern analysis of this formula shows it to be, well, little more than simple black ink. 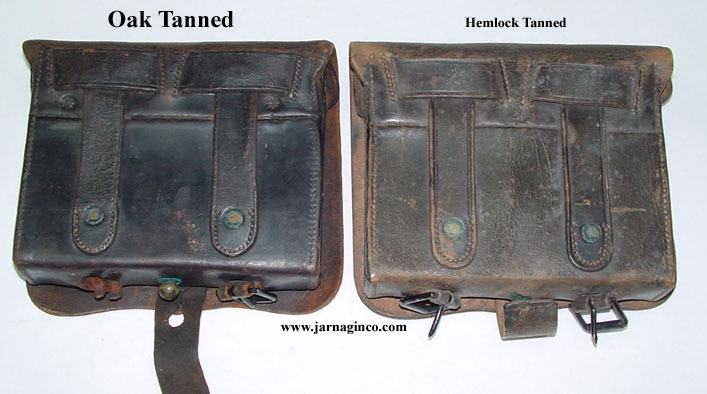 There was one other problem ordnance officers noted about the use of hemlock tanned leather. As noted in the Ordnance Report above, “doctored” hemlock tanned leather “used for scabbards, or iron and steel came in contact with it, the alum and salt and vitriol, &c, used to bleach it rusted the iron and steel …..” Actually, it was not the bleaching that caused the rusting of metal but rather the overuse of acids added in the tanning process. Normal vegetable tanning such as with oak, is accomplished in an acidic condition, with a pH in the 3.5 to 5.0 range. Hemlock bark has a problem in that it will not turn acidic on it’s own so the tanner routinely added sulfuric acid to facilitate the tanning process. 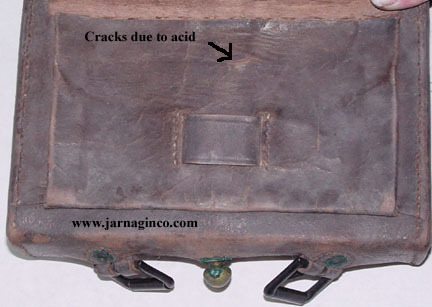 However, the over use of this acid will certainly cause cracks in leather, as well as rust any iron or steel coming into contact with the leather if not neutralized. Thus affecting the quality. See Figures 1 & 2. The fact is, tanners did not use “alum and salt and vitriol” to bleach the leather as has been noted above but rather were simply tanning Hemlock using too much sulphuric acid. Acid that later affected the quality of the leather. This represents yet another instance in which the ordnance officers misunderstood the tanning process. The use of alum, salt and vitriol is not used to bleach leather but rather used an entirely different “mineral” tanning process of the period called “Hungary” tanning. 13. Figure 6: Photos of two 1864 dated Watertown Arsenal cartridge boxes side by side. The box on the left is Chestnut Oak tanned and still retains its dark black dye finish. The one on right is Hemlock tanned that has turned its signature brown. Fading on Hemlock leather will result regardless of the finish applied to the leather. Just how much leather was required to equip six hundred thousand Federal soldiers in the first year or so of the war? To give you an idea, the U.S. Army’s 1862 Ordnance Manual lists the amount of leather required to make each of the military accoutrement items. According to the manual, the shell of eleven cartridge boxes could be cut from one side of heavy bridle leather. For the inner cover and pockets the manual specified that fifty of each item could be obtained from each side of light bridle leather. To make 600,000 cartridge boxes, approximately 54,546 sides of heavy bridle leather and 24,000 sides of light bridle leather would be needed. So, just for cartridge boxes a total of about 78,546 sides of leather were needed to equip the Federal Army. When one then considers what was required to make other items including cap boxes, belts, shoulder straps, bayonet scabbards, saddles, bridles, saddle bags, artillery harness and more, the demand for leather was staggering and must have nearly overwhelmed the Federal Ordnance system and the tanners ability to supply them! 14. There can be no doubt the northern tanning industry provided an invaluable service to the war effort but not without questions of profiteering by some of their brethren. As can be seen, some contract tanners of the period were very adept and apparently quite successful at substituting hemlock tanned leather for oak and then, giving it the appearance of being properly dyed black. It also appears that ordnance officers were often being deliberately confused and mislead by the tanning industry in order to accept improperly dyed hemlock tanned leather. This most certainly widened profit margins at the expense of the regulations and sometimes the quality of equipment being issued and yet, it may have been condoned to some extent. Although it is not clear how successful ordnance inspectors were at detecting poorly dyed equipments the large number of surviving hemlock tanned equipments and contemporary documentation clearly indicate a significant number were made and issued into the field. One can only speculate but, given the heavy strain on tanneries and the colossal need for leather it is probable neither the Ordnance Department nor their finishing contractors had the luxury to be too picky when it came to the leather they received. Professor H. Dussance, Chemist, A New and Complete Treatise on the Arts of tanning, Currying, and Leather – Dressing. (Philadelphia, Penn., Henry Carey Baird, T.K. and P.G Collins Printers, 1867), pg. 20. Thomas, P. Kettell, Eighty Years’ Progress of the United States. (Hartford, Conn.,, L Stebbins), 1867, Pg. 316. Paul Johnson, Civil War Cartridge Boxes of the Union Infantryman, (Lincoln, R.I., Andrew Mowbray Publisher, 1998), Pg. 176. Notes On Leather, Ordnance Notes, No. LXXII, National Armory, Washington, October 10, 1877, pg. 576. Ordnance Memoranda forwarded to Chief of Ordnance Brig, Gen. S.V. Benet by J. G Benton. Lt. Col. cmdg. National Armory in Philadelphia, Pa. Authorized for publication by the Secretary of War. Photo copy of original in possession of author. Quartermaster Report, January 20, 1877,. John F. Ridgers, Captain and Military Storekeeper, Philadelphia Depot of the Quartermaster’s Department to Brig, Gen. M.C. Meigs, Quartermaster General, U.S.A. Washington DC.. Page 257. Photocopy of original in possession of author. James Boyd & Sons to Ramsey, Boston, Mass., April 30, 1864, National Archives Washington DC, Record Group 156, Entry 21, Box 233, Document #0-27. Paul Johnson, Civil War Cartridge Boxes of the Union Infantryman, (Lincoln, R.I., Andrew Mowbray Publisher, 1998), Pg. 235. Campbell Morfit, The Arts of Tanning, Currying and Leather Dressing, Theoretically and Practically Considered in All Their Details, (Philadelphia, Pa. Henry Carey Baird, 1852), pg. 88. James Boyd & Sons to Ramsey, Boston, Mass., December 24, 1863, National Archives Washington DC, Record Group 156, Entry 21, Box 215, Document #B-536. Ramsey to Editor, Morning Chronicle., July 4, 1864, National Archives Washington DC, Record Group 156, Entry 13, Volume 3, Box 324. Campbell Morfit, The Arts of Tanning, Currying and Leather Dressing, Theoretically and Practically Considered in All Their Details, (Philadelphia, Pa. Henry Carey Baird, 1852), pgs. 493-495. Campbell Morfit, The Arts of Tanning, Currying and Leather Dressing, Theoretically and Practically Considered in All Their Details, (Philadelphia, Pa. Henry Carey Baird, 1852), pgs. 415-432.